I could only make out the first word, “sokout” (silence), but every time I looked at it, it focused my mind. “Silence: the breath is precious” is a command to observe silence, followed by an explanation of why silence is important: if we do not attain the state of silence, our precious life – symbolised by our breath – is wasted. At the same time, the explanation points to the method whereby we can achieve silence: through attention to the breath. To maintain silence is part of the practice of most spiritual disciplines. Silence here means not only to refrain from speech but also to become free from the endless internal dialogue and mental chattering we experience in our everyday lives. This form of sound, the internal “noise,” is by far the more difficult one to deal with, and to do so requires our constant attention. The internal dialogue is a hindrance to our spiritual progress. It puts us to “sleep,” making us oblivious to the world and our surroundings, not to mention any sense of the divine. Daydreaming is a good illustration of this point. Sometimes after driving for a long time, we are astonished at how we have arrived at our destination without remembering much of anything about our driving or the places we passed through. It is as though we had been asleep and are suddenly woken up at the end of our trip. During the whole journey we failed to observe or connect with the world in any active or real way. At times, the internal dialogue turns into self-indulgence. For example, when we feel we have been wronged or treated unfairly by another person, we often become angry and resentful or even feel despair. In our minds we go back repeatedly to the dialogue or event that has upset us, sometimes “rewriting” what actually happened to create an outcome that shows us in a better light and makes us feel better. Or we play out different strategies for how to behave when we next meet the person, often inventing scenarios in which we have all the “good lines” and the conflict is resolved in a manner that pleases us. Although we know these thoughts are for the most part fantasies that bring us momentary comfort at best, we nevertheless return to them over and over. Very seldom, though, can we resolve our conflict or dispose of our anger by carrying out such internal dialogue. At the end, the “mental noise” leaves us exasperated. This is not to deny the importance of mental activity in our lives. In everyday life our minds are constantly busy – thinking, planning, anticipating, judging, deciding, hoping, etc. It goes without saying that we need to utilize our mental faculties to get through the day. But when the focus of the internal dialogue is the “self” we lose touch with the world and others. We become self-obsessed. We fail to truly see others, to feel their emotions and to connect with them. A person who is too wrapped up in his or her mind cannot “see” any reality beyond his or her own inner thoughts and imaginings. Whether it is conscious or unconscious, the internal dialogue or mental “noise” disconnects us from the world and the people around us. The spiritual journey, therefore, begins only when we start to remove our attention from this noise and to concentrate it elsewhere, to move toward a silence that enables us to become more in tune with the world and the people around us. One way to overcome the mental “noise” is to seek a life of isolation, adopting the view that the less one is involved with the world and people, the more one may enjoy a life of inner silence. To be sure a person who lives in isolation and engages in constant meditation and prayer or a farmer who lives in a remote place with no contact with others is more likely to enjoy inner peace and silence than those whose lives require them to deal with others. But there is always a risk that such ways of life will lead one to lose his or her balance and self-discipline upon returning to the world and to once again become engulfed by the mental noise created by living among people. More significantly, a life of isolation, although perhaps a solution to the problem of inner “noise”, is not ultimately a fulfilling life. We understand ourselves better, namely, our strengths and weaknesses as human beings, only when we struggle to live in harmony with others, and to treat all people with tolerance and respect, even if they do not think and behave as we do or as we would like. 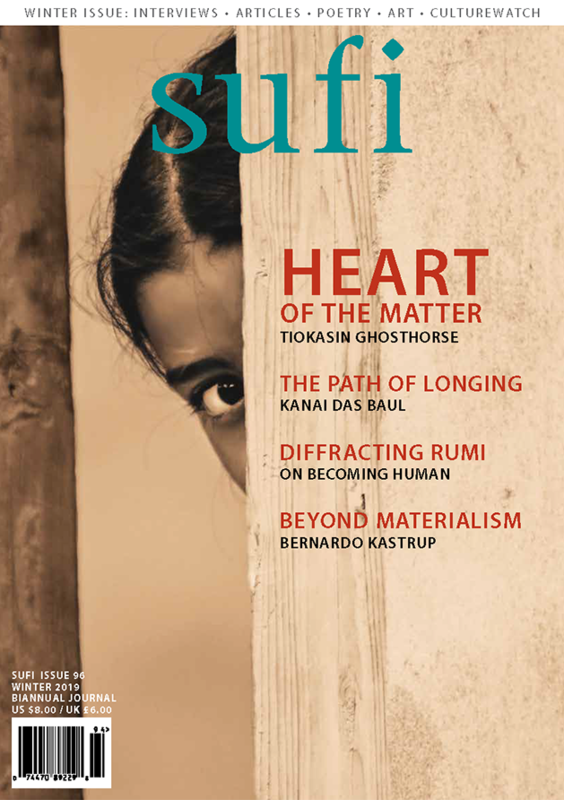 The Sufi path requires us to inwardly renounce the world by turning our attention away from the inner noise that connects us to it, while at the same time fulfilling our responsibilities as people engaged in the social life of the world. To do this we need to attain the state of silence. When we observe the breath we are no longer participants in our internal dialogue. It is as though our attention is projected outwards, leaving the whole content of our habitual thoughts and associations behind. We become like a master carpenter who is fully engaged with his craft, focused on the work in front of him with complete silence of mind. To be sure, the mental “noise” continues as long as we live, but paying attention to the breath makes the noise irrelevant and helps to free us from our preoccupation with imaginings about the past and the future. We become like impartial bystanders, observers, who no longer take part in the internal dialogue as our attention is focused solely on the breath in the present moment. For Sufis the breath is a medium for the remembrance of God, as Sufis remember God through their breath. This practice results in all thoughts and desires being washed away and the attainment of inner silence. Remembrance of God in this manner silences the endless noise and chattering of the mind. When the mind is silenced the heart is awakened, whereupon we experience a state in which we begin to accept and love others. It requires considerable practice to sit in silence and concentrate on the breath and, through the breath, on the divine. Very often, especially in the case of those who are new to meditation, the mind wanders off to the realm of daydreaming and attention to the breath is lost. One needs to be reminded constantly to focus on the breath and to avoid participating in the internal dialogue. In the Sufi tradition music has played the role of a watchdog that signals us to return to the right track, to the present moment, and to help us focus again and again on the breath and the divine. At first sight it may appear that by listening to music we are allowing more noise to enter our minds, thereby taking us further away from the state of silence. Indeed some music does exactly that, making it difficult for us to observe the breath. But, when effective, music can serve as a guide steering the lost travellers to the right course, the path of the breath. Music, whether secular or spiritual, has the propensity to move us. We may feel different emotions associated with different kinds of music. We may experience emotions while listening to music partly because of the circumstances in which we heard such music for the first time and partly because of our cultural norms, that is, the way we are taught to associate certain music with certain emotions. Whatever the reason, the fact remains that we do experience a variety of emotions when we listen to music. Sufi poetry is an expression of human love for the divine, and when it is put to music it can create in us the experience of longing and love for God, albeit for a very brief moment. Music is there to encourage us on the path of love. In this respect, music is also a reminder that observance of silence and the breath is only the beginning of the path. The aim is to reach the divine through love.